It's no secret I love baking and decorating layer cakes - I think it's their height that could almost be called majestic, and the limitless possibilities for fillings, frostings and garnishes that makes them so much fun to make. But if given a choice between eating cake or pie, I would probably choose pie (mostly because I'm a little tired of buttercream at the moment). So in planning the dessert I was bringing to our Easter dinner with some friends, I decided that a couple of cool and creamy pies to follow our meal of ham, rolls, potatoes and cheesy broccoli casserole would be a delicious end. 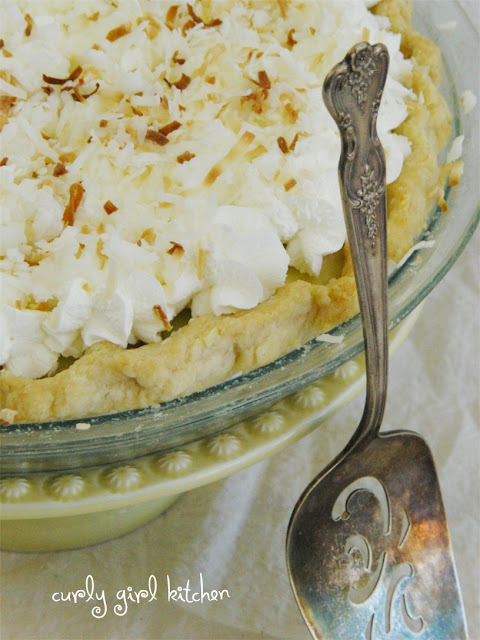 Coconut Cream Pie is pure, Southern comfort food, and I felt my inner raised-in-South-Carolina Southern girl come out as I baked pastry and stirred hot coconut custard on the stove. And I'm not talking about plain vanilla pudding with a little coconut mixed in, but a rich custard made from egg yolks, cream and coconut milk. After I stirred in butter and coconut, I could have eaten that creamy custard by the spoonful straight from the saucepan. 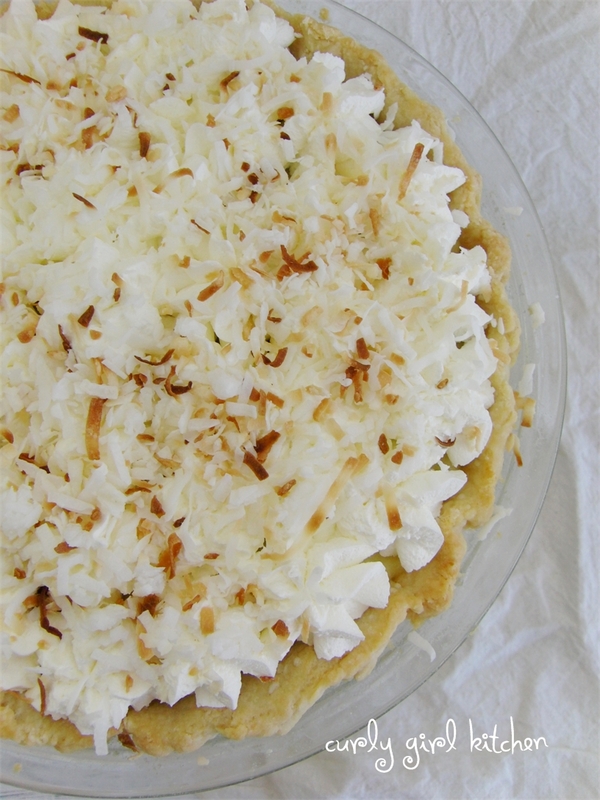 Lots of freshly whipped cream and a sprinkling of toasted coconut are all the garnish this pie needs. My parents happen to love coconut cream pie, and if you peek into their freezer, you're likely to find one or two frozen cream pies by Marie Callender, just waiting to be thawed out for company. But I dare to say mine is just as good, if not better. 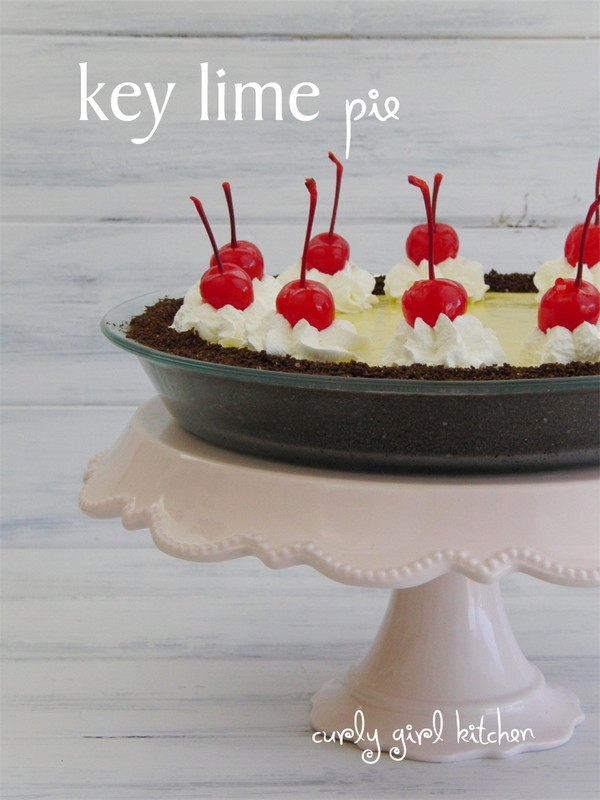 Key Lime Pie is another favorite, and I adore the balance of tart citrus with the sweet and salty crust. I started mine with a salted, chocolate graham cracker crust, but regular graham crackers would be yummy, too. The filling for key lime pie doesn't need to be complicated - just egg yolks and sweetened condensed milk, with key lime juice and lots of lime zest for tartness. 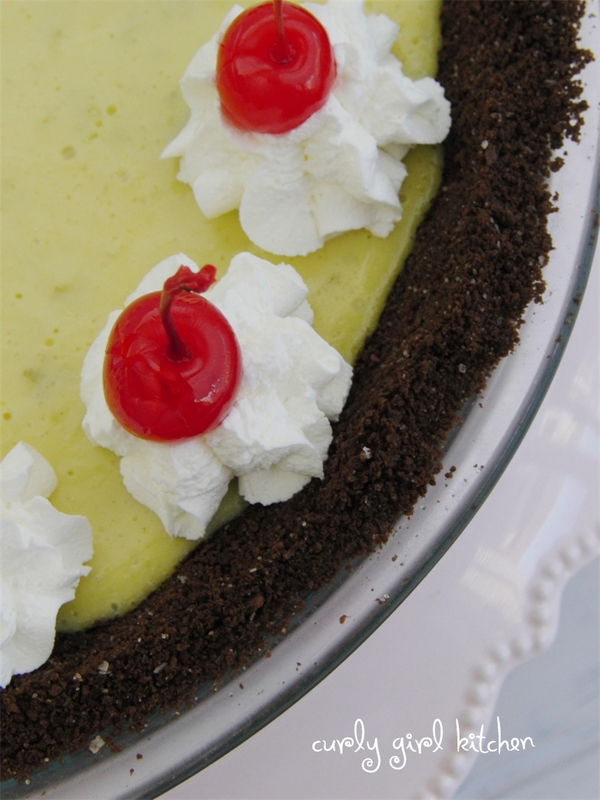 A chemical reaction occurs between the sweetened condensed milk and the acid in the lime juice, and it actually works to thicken the filling, so this doesn't require a long baking time. Really, the baking is just to cook the eggs a little, and then the pie finishes thickening as it chills. 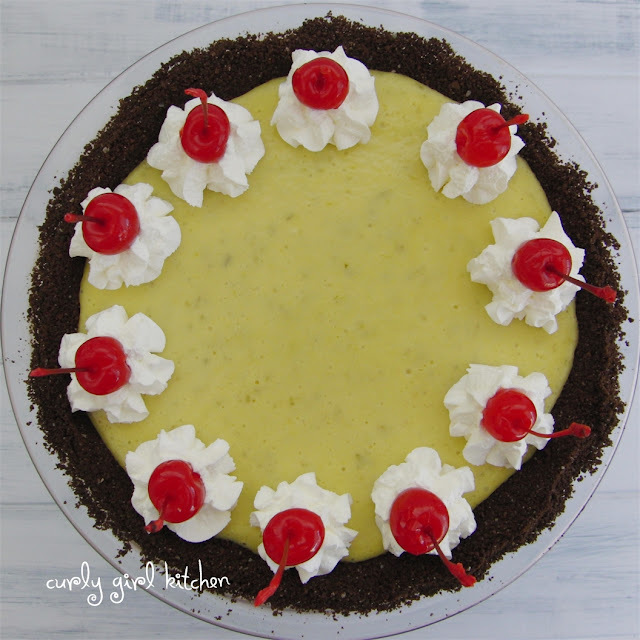 Some swirls of whipped cream topped with maraschino cherries were a pretty garnish, but many people would cover the pie with more whipped cream, or maybe even piled high with meringue. Which pie would you rather have a slice of? To make the pie crust, combine the flour, sugar and salt in a bowl. Scatter the cold butter over the flour mixture and use a pastry cutter to cut in the butter until pea-sized pieces remain. Sprinkle the ice water over the mixture and work in with your hands until the dough comes together. Roll dough out on a lightly floured surface 1/4 inch thick. Fit the dough into a pie pan and crimp the edges. The crust will need to be "blind baked" to hold its shape. Spray a piece of foil with non-stick spray and fit the foil against the dough. Fill the foil with pie weights or dry beans. Bake for 25 minutes. Carefully lift out the foil and bake the crust for 10 more minutes until golden brown. Set aside to cool completely. In a saucepan, whisk together the coconut milk, whole milk, sugar and corn starch. Bring to a gentle simmer over medium low heat. In a small bowl, lightly beat the egg yolks. When the milk mixture begins to simmer, slowly drizzle a cup of the mixture into the egg yolks, whisking them constantly to temper them. Scrape the egg mixture back into the saucepan. Whisking constantly, bring the custard to a boil, then cook, continuing to whisk constantly, until thickened, about 2 minutes. Remove from the heat. Stir in the vanilla and coconut extracts, then the butter, one piece at a time, until smooth. Fold in the coconut. Spoon into the cooled pie crust. Refrigerate for several hours until chilled and set. 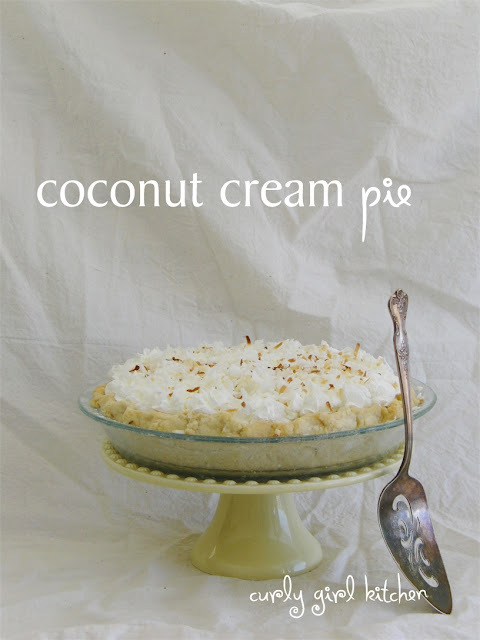 Top with sweetened whipped cream and toasted coconut. Preheat the oven to 350. Spray a pie plate with non-stick spray. In a bowl, combine the crushed graham crackers, sugar and salt, then drizzle the butter over the crumbs and toss with a fork until moistened throughout. Press the crumbs into the pie plate and bake for 10 minutes. 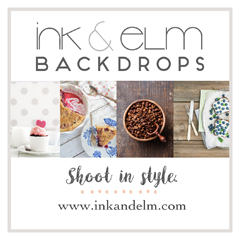 Set aside to cool completely on a wire rack. Reduce the oven temperature to 325. In a large bowl, whisk together the key lime juice, zest, egg yolks and sweetened condensed milk until well combined. Pour over the cooled crust. Bake for approximately 15 minutes, until the filling is somewhat set, but still jiggly. Cool at room temperature for 1 hour, then chill in the refrigerator until thoroughly chilled. Whip the heavy cream and powdered sugar until medium/firm peaks form. Scrape into a piping bag fitted with a star or swirl tip, and pipe dollops of whipped cream around the pie. Top each dollop of cream with a cherry. Thank you, Rosie! I wish I had gotten pictures of them when they were sliced, but we cut into them at a friend's house and I didn't have my camera with me.